For those of you who are Detroit Lions fans, they picked a guy with a reel gud brain (LINK). If you just came here for the girls, hit the jump. I won't claim to be an NFL expert, but as a big college and pro football fan, I like to take my shot at an NFL mock draft and see how I stack up against Mel Kiper, Todd McShay, Mike Mayock, and the like. So here's my 2015 mock NFL Draft. If any trades are announced before the beginning of the draft, I reserve the right to make some changes. Otherwise, I'm guessing roughly 27 of these picks will be 100% accurate. I don't like the idea of spending a #1 pick on someone with such character concerns, but it looks like that's the direction the Bucs will go. There seems to be a good chance that someone trades into this spot to take Mariota. I think it's probably too high to take Mariota, but teams get desperate when looking for a quarterback. Jacksonville went after a quarterback last year, so now it's time to shore up the pass rush. Oakland is in need of a receiving threat. When's the last time they had a consistent wide receiver threat? Williams is a little bit inconsistent, so he would fit in well with the 'Skins. Hit the jump for picks 6-32. Jim Harbaugh has incited a bit of a war of words with SEC coaches (LINK). Hit the jump for a few good looking ladies. At this time I only know of one prospect headed to Ann Arbor this weekend. Ben Bredeson - OT - Hartland (WI) Arrowhead: Bredeson is a 6'5", 270 lb. prospect with offers from Alabama, LSU, Michigan, Notre Dame, Ohio State, and Wisconsin, among others. He's a 247 Composite 5-star, the #4 offensive tackle, and #27 overall. Michigan and Notre Dame are thought to be the front-runners, and Bredeson's older brother has committed to play baseball at Michigan. Ben is planning to choose his school within the next month or so. UPDATE: Bredeson is no longer visiting this weekend since it's graduation weekend. He has rescheduled the visit for May 30th. Austin Mack - WR - Fort Wayne (IN) Bishop Luers: Mack is a 6'2", 205 lb. prospect with offers from Michigan, Ohio State, and Notre Dame, along with numerous others. He's a 247 Sports 4-star, the #20 wide receiver, and #129 overall. Michigan jumped out to an early lead in his recruitment when they initially offered, but the Wolverines have since fallen behind Notre Dame and Ohio State. The Buckeyes currently have 84% of the 247 Sports Crystal Ball predictions. As a junior in 2014, he caught 69 passes for 1,062 yards and 15 touchdowns. As the NFL Draft approaches on Thursday, Friday, and Saturday, we are bound to see a couple Michigan players' names called. From 2009-2014, Michigan has been going back and forth between having two and three players drafted (LINK). If that trend continues, just two of these players will be selected. Linked to each player's name is their senior profile, in which I detail some of their workout numbers and a projection. Devin Funchess, WR: Funchess is the one guy who might sniff the first round, but it would take a leap of faith by a daring team. A wide receiver with a tight end body, he has never been a plus blocker despite being much taller and heavier than the corners and safeties he has faced. When Michigan actually played him at tight end during his freshman and sophomore seasons, he was downright terrible as a blocker. However, he is large and fairly fast and has a 38.5" vertical. I would not advise a team to take him as a tight end because he doesn't have the blocking chops, but he's a guy who can be a mismatch problem for a team that likes to be creative and use multiple tight ends. 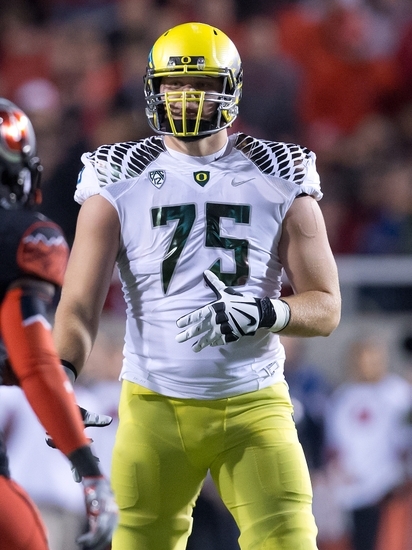 My wild guess: 2nd round (#44 overall) to the New Orleans Saints. Hit the jump for a rundown of Michigan's other draft-eligible players. Former Wolverine Frank Clark is hoping to get drafted this weekend (LINK). Thanks for your generous donations and purchases on Amazon! If you would like to donate to the site redesign drive, please use Paypal (on the left sidebar) or do some shopping on Amazon (LINK). 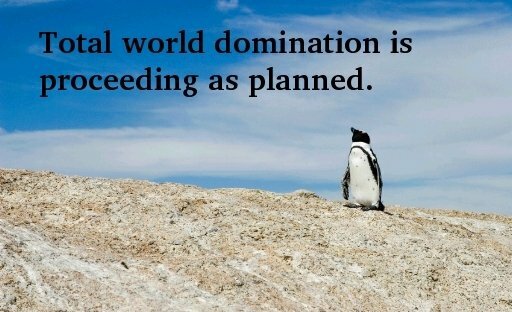 I had a productive meeting with a web developer last week, and things are rolling forward. Thanks! A product of Detroit's Inkster High School - which is no longer open - Gardner was a Rivals 4-star, the #1 dual-threat quarterback, and #132 overall in the 2010 class. He chose the Wolverines over offers from Michigan State, Nebraska, Notre Dame, Ohio State, and Oregon, among others. I was not giving out TTB Ratings at the time, but I named him Michigan's best recruit in the class (LINK). Hit the jump for lots more on Gardner's career. 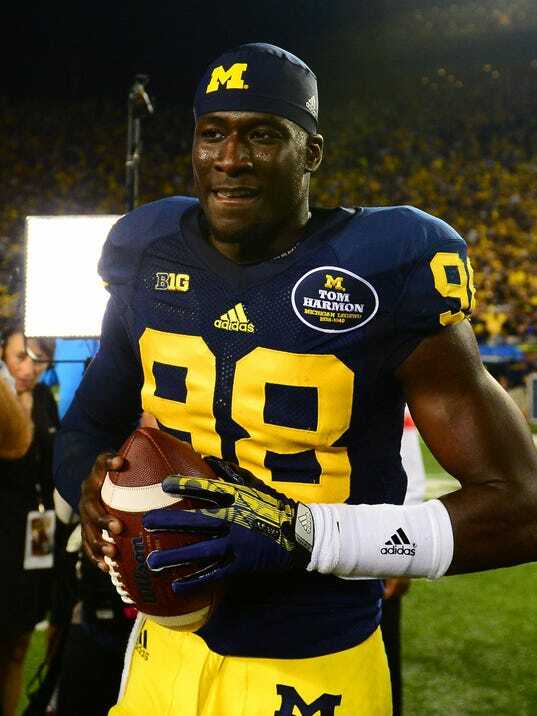 Devin Gardner is hoping to get drafted this weekend (LINK). Hit the jump for several good looking ladies. Lakewood (OH) St. Edward cornerback Tony Butler, a Pitt commit, was offered by Michigan. He's a 6'2", 195 lb. prospect who also holds offers from Arizona State, Iowa, Kentucky, Maryland, and Rutgers, among others. He's a 247 Composite 3-star, the #56 cornerback, and #600 overall. As a junior in 2014, he made 27 tackles, 3 interceptions, and 10 pass breakups. He's a big corner who might project best to safety. Butler played for Michigan's new director of football operations, Rick Finotti, who was head coach at St. Edward through last season. Despite maintaining a hard commitment to Pitt, Butler is expected to at least put some thought into attending Michigan, a school he visited in early April. Cranford (NJ) Cranford offensive tackle Will Fries was offered by Michigan. He's a 6'6", 270 lb. prospect with offers from Clemson, Maryland, Miami, Penn State, Pitt, Rutgers, and South Carolina, among others. He's a 247 Composite 3-star, the #38 offensive tackle, and #392 overall. Fries is a big, lean body who's aggressive and bends well, but his footwork needs a lot of refinement. The Nittany Lions appear to be the favorite. Hit the jump for a new 2017 offer, some guys who committed elsewhere, and some random tidbits. This Bruce Feldman piece helps explain Virginia Tech defensive coordinator Bud Foster's plan for defeating the Buckeyes last September (LINK). Hit the jump for pictures from the front, the side, and the back. Hit the jump for the ESPN video. 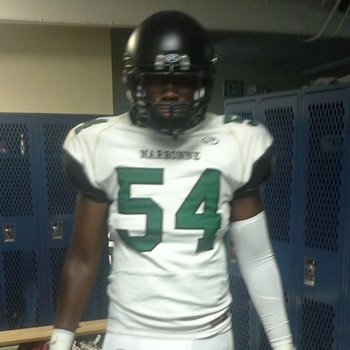 Alex Akingbulu - OT - Harbor City (CA) Narbonne: Akingbulu is a 6'6", 250 lb. prospect with offers from Cal, Michigan, UCLA, and Utah, among others. He's a 247 Composite 3-star, the #39 offensive tackle, and #400 overall. He is an extremely athletic offensive tackle who needs to fill out, but he could be a multi-year starter on the blind side. Devery Hamilton - OT - Baltimore (MD) Gilman: Hamilton is a 6'6", 290 lb. prospect with offers from Clemson, LSU, Maryland, Michigan, Penn State, Stanford, and others. He's a 247 Composite 4-star, the #25 offensive tackle, and #235 overall. He plays for the alma mater of Michigan tight end/defensive end Henry Poggi. Hamilton does not talk much to the media, but he did report a positive experience from his visit to Michigan on Thursday. Jimmy Jaggers - TE - Roseville (CA) Roseville: Jaggers is a 6'4", 230 lb. prospect with an offer from Louisville. He's a 247 Sports 4-star, the #4 tight end, and #205 overall. He will be visiting on Tuesday, April 28. Jim Harbaugh invited all the coaches to Michigan's camp in June (LINK). Hit the jump for some beautiful women. It's Friday night, and I don't know about you, but it's been a long week for me. Enjoy some pictures of good looking ladies! This was a thoroughly enjoyable piece by Brian Cook on Jim Harbaugh and Exposure U (LINK). Hit the jump for some pictures of Ashley Sky. It's scary that their last names are so close, but anyway, Rush Limbaugh has an opinion on Jim Harbaugh (LINK). Hit the jump for some very good looking ladies. 60. Jauan Williams - OT - Washington, D.C.
154. Terrell Hall - DE - Washington, D.C.
161. Richard Merritt - OG - Washington, D.C. Thanks to Richard and Ronald for the generous donations! If you would also like to donate to the site redesign drive, please use Paypal (on the left sidebar) or do some shopping on Amazon (LINK). Thanks! Notes: Holds offers from Alabama, Arkansas, Duke, Florida State, Georgia, Illinois, Kentucky, Maryland, Michigan, Michigan State, Ohio State, Penn State, Rutgers, South Carolina, Tennessee, UCLA, and Virginia Tech . . . ESPN unranked OG . . . Rivals 4-star, #5 OG, #124 overall . . . Scout 4-star, #10 OT, #71 overall . . . 247 Sports 4-star, #3 OG, #148 overall . . . Teammate of 2017 RB offeree Anthony McFarland, Jr. Projection: Offensive guard. Davis has a great body for the college level, but his athleticism doesn't match up. He has some bad weight on him, and a college strength and conditioning program will obviously help. But he needs a lot of technique work in the run game, and he plays too high to be very successful, which can be a difficult problem to fix. Davis needs to be in a pro-style system where his size and strength in confined spaces can be an asset. Frankly, I believe the three sites to have ranked him so far have placed him too high on their lists. He is certainly an FBS prospect but has somewhat limited utility until he refines his technique and gets in better shape. Likelihood of committing to Michigan: Strong. Davis has been tweeting about Michigan a lot, loved his visit this spring, has 56% of his Crystal Balls in favor of the Wolverines, and wore Michigan gear to camp last weekend (with his mom wearing a matching "M" cap). If National Signing Day were today, there's a very good chance he would be signing with Michigan. Hit the jump for discussion of khakis. Here's the video we've all been waiting for . . . or, you know, the video you watched last night on HBO. Andrea Kremer interviewed Jim Harbaugh (LINK). Hit the jump for some good times. Coming out of Plymouth (MI) Plymouth in 2011, Beyer was a Rivals 4-star, the #16 strongside end, and #201 overall. He committed in April of 2010 (LINK) and I gave him a TTB Rating of 82. Despite being rather unready physically, Beyer played as a backup SAM linebacker during his freshman year. It was a position that was roughly similar to weakside end, so he was not asked to drop back in coverage often. He made 11 tackles during his inaugural season. He started nine games as a sophomore, making 19 tackles, .5 tackles for loss, and 1 forced fumble. As a junior in 2013, he bounced from starting at SAM linebacker (when Jake Ryan was recovering from a torn ACL) to starting at strongside end. He made 27 tackles, 4 tackles for loss, 2 sacks, 1 forced fumble, and the biggest play of his career, a 7-yard interception return for a touchdown against Iowa (thrown by Jake Rudock, who will be playing for Michigan this coming fall). Beyer became the full-time starter at strongside end as a senior in 2014, finishing his final campaign with 35 tackles, 7.5 tackles for loss, and 5.5 sacks. I suppose in the grand scheme of things, my comparison between Roh and Beyer was quite apt. Both played linebacker for a spell before turning into strongside ends. Both also had trouble carrying enough weight for the strongside end position and were somewhat limited athletically. As you can see from the commitment post linked above, I always thought Beyer was a year behind where he should have been. He should have been redshirting in 2011 but he was a backup SAM. He should have been working his way slowly onto the field in 2012, but he started nine games. So on and so forth. Ideally, he would be entering his fifth year senior season and penciled in as a starter at one of the end positions. Early on in his career, I lamented Beyer's playing time because he simply didn't produce - through two seasons of significant playing time, he had exactly 30 total tackles and .5 tackles for loss. He started to come into his own during his last two seasons, when he was probably talented enough to be a spot starter or heavily used backup, but instead got pressed into duty as a SAM linebacker and strongside end, neither of which truly fit his skill set. Lamenting aside, he had a solid career and will always have that touchdown, which is a special moment for a defensive lineman. I WILL REMEMBER HIM FOR . . .
. . . returning that Jake Rudock interception for a touchdown. You can't help but love watching the big guys up front get an interception once in a while, let alone return it for a score. Beyer was not invited to the NFL Combine, but he had a decent performance at Michigan's pro day in mid-March. He ran a 4.9 forty, had a 4.12 shuttle, benched 225 lbs. 20 times, had a 33.5" vertical, and broad-jumped 9'2". He still probably won't get drafted simply because of the aforementioned lack of production. He lacks the size to be a strongside end in the NFL, and he lacks the speed to be an outside linebacker or weakside end at the next level. A team will probably bring him in for a tryout, but I doubt he will make an NFL roster. Jim Harbaugh and Jedd Fisch took Jameis Winston and Bryce Petty under their wings for a bit to teach them a few things about playing football in the NFL (LINK). Hit the jump if you want. Site News: Message board suggestions? I will be getting together with the web developer in the near future, and we will be working on a message board forum for the website. I have asked questions in the past about what you as readers/commenters want to see on the new website. Today I want to be more specific, if possible. The Wolverine (and other Rivals message boards) just rolled out a new forum format; some people are pleased, and others are disgruntled. The most experience I have with a message board is at MGoBlog, which functions well but has a few glitches. What message board formats/features do you like best? You can leave links to other forums in the comments so I can check them out. Are usernames sufficient? Or are avatars necessary? What are your thoughts on upvotes/downvotes? So far it seems I have had more people railing against voting on comments than people in support of it. I am indifferent as of now. As always, thanks for reading and thanks for your suggestions! Thanks to Karl for the generous donation yesterday! If you would also like to donate to the site redesign drive, please use Paypal (on the left sidebar) or do some shopping on Amazon (LINK). Danke sehr! Bloomfield Hills (MI) Brother Rice tight end Carter Dunaway committed to Michigan (LINK). Olney (MD) Good Counsel linebacker Jordan Anthony was offered by Michigan. He's a 6'0", 210 lb. prospect with offers from Clemson, Iowa, Kentucky, and Maryland. He's a 247 Sports 4-star, the #9 outside linebacker, and #110 overall. Anthony is a speedy linebacker who would probably be a weakside linebacker in college. Good Counsel is the alma mater of Michigan fifth year senior cornerback Blake Countess. Los Angeles (CA) Hawkins wide receiver Taariq Johnson was offered by Michigan. He's a 6'4", 210 lb. prospect with offers from Baylor, Miami, and Ohio. He's a 247 Sports 4-star, the #19 wide receiver, and #127 overall. Johnson is big enough to be a potential tight end. He's a recent transfer from Long Beach (CA) Poly, and his highlights were removed from their Hudl page, so all I have to go on right now is a few highlights from a camp. Two of Johnson's 2017 teammates include running back Greg Johnson and wide receiver Joseph Lewis, both of whom already hold offers from the Wolverines. Hit the jump for several more new offers, a few guys who committed elsewhere, and some random bits. Well, at least Jim Harbaugh acknowledges that he might wear out his welcome with his personality (LINK). That might be tougher to do in Ann Arbor since he's a Michigan legend, but perhaps his acknowledgement of the issue might help him curb it. Thanks to Josh for the recent donation! If you would also like to donate to the site redesign drive, please use Paypal (on the left sidebar) or do some shopping on Amazon (LINK). Muchas gracias! Houston transfer quarterback John O'Korn finally got a writeup (LINK). Moultried (GA) Colquitt linebacker Ja'Quain Blakely was offered by Michigan. He's a 6'2", 205 lb. prospect with offers from Arkansas, Florida, Iowa, Mississippi State, Nebraska, and Tennessee, among others. He's a 247 Composite 3-star, the #34 outside linebacker, and #476 overall. Blakely has some good coverage ability and changes direction well in space. He named Florida his early leader after they offered, although other schools have continued to come in with offers in recent weeks. 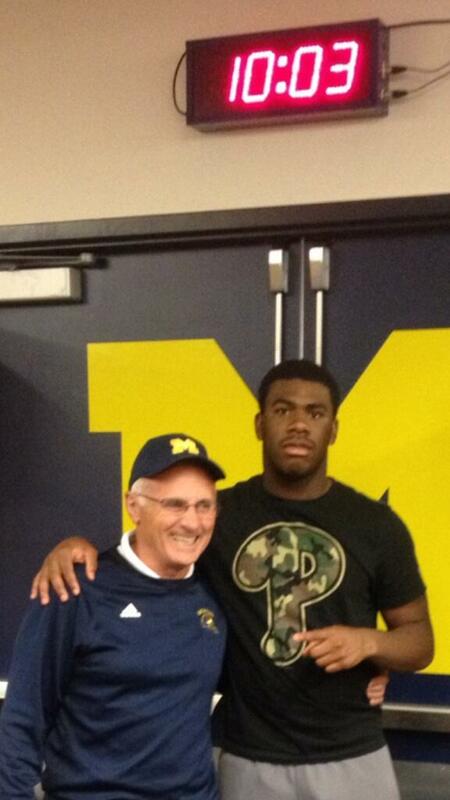 Lake Forest (IL) Academy defensive end Daniel Joseph was offered by Michigan. He's a 6'3", 240 lb. prospect with offers from Illinois, Iowa, Michigan State, Nebraska, and Stanford, among others. 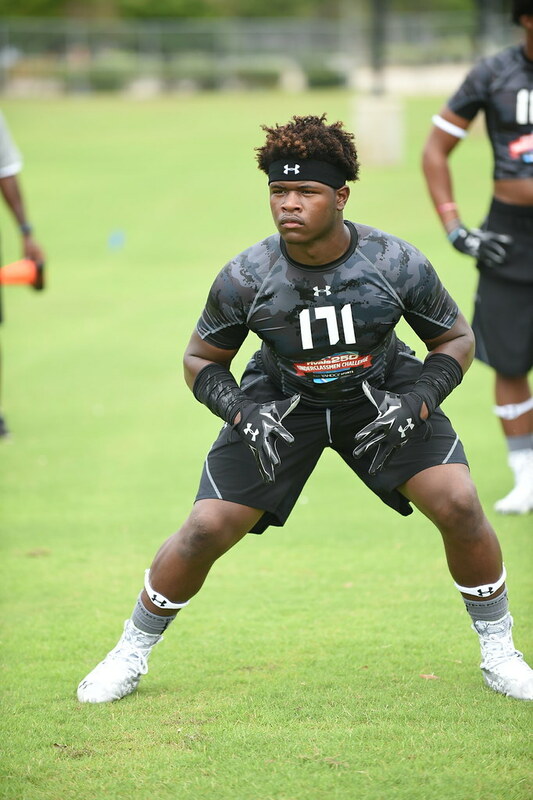 He's a 247 Composite 4-star, the #16 strongside end, and #267 overall. Joseph looks a little passive at times, especially when taking on blockers, but he's an aggressive tackler. He also shows some impressive athleticism in the linked highlight when he leaps for a one-handed touchdown reception, although he does not consistently show that kind of effort. His two leaders at this time appear to be Iowa and Michigan State. Hit the jump for a couple guys added to the board, several guys who committed elsewhere, and some random bits. Jake Ryan is ready to be done with the NFL draft preparation (LINK). I must have missed this when it happened, but I just came across Michael Jordan and Tom Brady playing pickup basketball together in the Bahamas (LINK). UPDATE: Link is fixed. If that isn't cool enough, check out some beautiful women beyond the jump. Nick Baumgardner talks about the new environment now that Jim Harbaugh has taken over (LINK). Hit the jump for some pictures of Kim DeJesus, the wife of Major League Baseball player David DeJesus. Thanks to Ken for the recent donation! If you would like to donate to the TTB redesign, please use Paypal (on the left sidebar) or do some shopping on Amazon (LINK). Thanks! Bloomfield Hills (MI) Brother Rice tight end Carter Dunaway committed to Michigan on Friday night. The 2017 prospect had no other offers at the time of his commitment. Dunaway is 6'6", 232 lbs. and, according to Maxpreps, had 1 catch for 9 yards (plus a two-point conversion) as a sophomore in 2014. Hit the jump for more on Dunaway and his commitment to Michigan. It's Friday night, so enjoy some pictures of beautiful ladies, including the best way to use power tools! Hit the jump for all of Michigan's targets on the list. Saline (MI) Saline running back Kevin Gross recently posted on Twitter that he would be walking on to Michigan's football team, giving Michigan at least seven preferred walk-ons for the fall. Sometimes walk-ons never contribute, sometimes they play special teams, and sometimes they play significantly. For whatever reason(s), these past few seasons have featured several walk-ons in prominent roles: Jordan Kovacs, Graham Glasgow, and Ryan Glasgow, among others. The Glasgows were the preferred kind, which means they were guaranteed a spot on the team in fall camp. In addition to the 85 scholarship players, 20 more (for a total of 105) can begin fall camp and practice with the team from day one. More players can join the team after the first day of classes, but these players will be there learning and earning their shot from day one. Kovacs, on the other hand, was a student body walk-on, meaning basically that the coaches had no idea who he was before he showed up for a tryout in the middle of the year. Hit the jump for the profiles and highlights of the seven walk-ons. Michigan's coaching staff is going on the road this summer to try to gain a foothold in tough-to-reach recruiting areas (LINK). Hit the jump for three beautiful women. I like #2 and #3, in particular. If you're feeling generous, please donate to the website redesign drive using Paypal (on the left sidebar) or by shopping on Amazon (LINK). Thanks! Projection: Tight end/H-back. Upshur has the tenacity to become an inline tight end and blocker, but he lacks ideal size for the position and might top out around 240 lbs. He probably projects best as a complementary tight end or an H-back type who can go in motion, line up as a wing, work out of the slot, etc. He is not a mismatch in the passing game because he lacks the explosiveness and catching radius to beat well trained pass defenders. However, he could be effective on seam routes, an occasional bubble screen, bootlegs, etc. He will also be a strong point in the running game, where he can latch onto and overpower second-level defenders. If offense doesn't work out, Upshur could also play defensive end, where he has some explosiveness and a nose for the ball. Reminds me of: Khalid Hill. Upshur's size is similar to that of Vernon Davis, but he lacks the same kind of speed. Hill is a similar type of player in regard to pass catching and overall physical profile, but Upshur is more explosive and a stronger blocker. Likelihood of committing to Michigan: Steve Lorenz recently predicted that Upshur would end up committing to Michigan. Jay Harbaugh is his recruiter and has been coming after him hard. He essentially has his choice of schools, and there has been some talk about him playing with Maryland quarterback Dwayne Haskins, who is bound for somewhere other than Ann Arbor. Overall, Michigan is one of his top few schools right now and at least has a strong chance to secure his commitment. Former Wolverine Dhani Jones thinks that getting rid of helmets and bulky equipment might help the game of football (LINK). Hit the jump for some pictures of Daphne Joy. Thanks to Paul and Michael for the recent donations! If others would like to donate to the redesign effort, you can use Paypal (on the left sidebar) or do some shopping on Amazon (LINK). The goal is for $3,000 total. Houston quarterback John O'Korn is transferring to Michigan. You already know this if you are a Michigan football blogosphere fanatic, but I didn't want to write a commitment post until things were more concrete. So here we are. O'Korn is a 6'4", 220-pounder who attended Fort Lauderdale (FL) St. Thomas Aquinas before committing to Houston; he also had offers from Arkansas, Louisville, Mississippi State, and North Carolina, among others. Coincidentally, he played at the same school as incoming graduate transfer Jake Rudock. O'Korn started for Houston as a freshman after the starter got knocked out with concussions; O'Korn was named American Athletic Conference Rookie of the Year for his performance. He then lost his starting job in the middle of his sophomore year and is now headed to Ann Arbor. Hit the jump for more on O'Korn and his future at Michigan. Here's a report on the recent showing of American Sniper on Michigan's campus (LINK). Personally, I don't really understand all of the hullabaloo about Harbaugh tweeting out support for Chris Kyle and the movie American Sniper. In my time on Michigan's campus, I have seen a fair amount of "offensive" things that I simply chose to ignore. Harbaugh has talked in the past about liking to watch people who are really good at their jobs, regardless of what those jobs are, and Kyle was extremely good at his job. Add to that the fact that the movie addresses a big event in all of our lifetimes, and it also professes a love for something bigger than the individual. Anyone who misconstrues the message of the movie into "I need to commit violence against Muslims" has a screw that's bound to come loose, anyway. There's no negative message in that movie that can't be derived from watching CNN or Fox News. Good people are going to be good, whether they're white, black, Muslim, Indian, Hispanic, Native American, Jewish, etc. Bad people are going to be bad, whether they're white, black, Muslim, Indian, Hispanic, Native American, Jewish, etc. And when it comes to showing that type of movie to a football team, the truth is that locker rooms are some of the most welcoming places on a school campus when it comes to race. Athletes learn at a very young age how to be part of a team and part of a family, and they also mix with people of other races as much as - if not more than - any other hobby, pastime, extracurricular activity, etc. If the "protesters" and "leaders" really want to engender change, they should be looking to educate those students and people who aren't exposed to other cultures so early and so frequently. 247 Sports released its top 247 prospects for 2017 (LINK). Burzynski attended Carlsbad (CA) Carlsbad and was not recruited out of high school. Burzynski walked on to Michigan's football program for Rich Rodriguez's final year in 2010. Too small and light to play, he redshirted. Still very light as a redshirt freshman, he played backup left guard in four games. He finally hit a reasonable playing weight (295 lbs.) in 2012 and saw action as a backup in eight games. During the 2013 season that saw an array of players moving about on the offensive line, Burzynski played in four games and finally earned a start against Indiana . . . and promptly tore his ACL, missing the rest of the season. As a fifth year senior in 2014, he played in just two games, one of those a start when Graham Glasgow was suspended for the season opener. Burzynski seemed like one of those players who was around forever, and then he practically disappeared as a senior. In 2012 and 2013, it seemed like he was a play or two away from getting in the game. This past season he was an afterthought. It used to seem quite rare that walk-ons were elevated to starter status, but we have seen that become a trend in the past several years, including Nick Sheridan, Kevin Leach, Jordan Kovacs, Graham Glasgow, Ryan Glasgow, and Burzynski occasionally. Not much can be said for Burzynski as a player, whom Brady Hoke seemed to love but was just so-so as a contributor at the Michigan level. He generally seemed to know his assignments, but he was not strong enough or big enough to get much movement. Kudos to him for making a five-year college career out of football. Burzynski's football career is presumably finished. I don't always agree with Nick Baumgardner's take on things, but here it is anyway (LINK). Hit the jump for pictures of Donnah Pham, Ellie Gonsalves, and some other good looking lady in a pink bikini. Site News: What do you want on the new site? UPDATE: This is bumped from its original post date of March 14. Thanks to the funds many of you have sent my way (Paypal is on the left sidebar if you're interested in helping), I have gathered enough to start the website redesign. I have a meeting with the developer this coming week, and I will continue to look for additional feedback from you, the reader. What requests do you have for the new site? Good morning, trusted TTB readers! I know I've been promising a new site for a while, and I actually have had a domain name and a new platform for an embarrassingly long time without doing anything about it. Unfortunately, while trolling around Wordpress, I realized that I have become pretty proficient at using Blogger . . . and not at all proficient at actually building a website from scratch. It's like your first girlfriend - you like her because you don't know any better. But it's time to be a grown-up and ask other people for help, so I am hiring a professional web developer to create my new site. We had a meeting the other day and should be getting rolling soon, even though it will surely take a bit of time to code and launch the new site. What other features would you like to see? What features do you like about the current site that might translate well to the new site? What advice do you have regarding the look of the site, the implementation of the message board, etc.? I am all ears and would like to hear your thoughts so I can be very specific when it's time to sit down with the web developer and hash out the details. I can't promise that all suggestions will be heeded, but you're my focus group. Thanks for reading (and commenting), and I'm looking forward to putting together a site that we all can enjoy! Thanks to Spencer for your recent donation! If anyone else would like to help with the effort to redesign the site, please use Paypal (on the left sidebar) or consider buying something from Amazon via the link (LINK) on the right sidebar. Southfield (MI) Southfield running back Matt Falcon committed to Michigan (LINK). Weber State punter Blake O'Neill is transferring to Michigan (LINK). Houston (TX) Westside defensive tackle Jordan Elliott decommitted from Baylor. He's a 6'4", 305 lb. prospect with offers from Alabama, Florida State, Oklahoma, Texas, Texas A&M, and USC, among others. He's a 247 Composite 4-star, the #12 defensive tackle, and #93 overall. As a junior in 2014, he made 78 tackles, 31 tackles for loss, and 12 sacks. The decommitment took place shortly after he took an unofficial visit to Texas, and the Longhorns are thought to be the favorite to land Elliott. Jacksonville (FL) First Coast wide receiver Kevin Stepherson was offered by Michigan. He's a 6'0", 180 lb. prospect with offers from LSU, Notre Dame, and others. He's a Rivals 3-star wideout and seems relatively unknown at this time, but he shows some good long speed and an ability to run after the catch. The Tigers and Fighting Irish make up his top two, so Michigan has some catching up to do. Hit the jump for several more new offers and some miscellaneous bits. Nick Baumgardner talks about how Jim Harbaugh's intensity convinced Jake Rudock to come to Michigan (LINK). Hit the jump for three good looking females. It's a day late, but let these ten pictures of beautiful women help you enjoy your weekend. 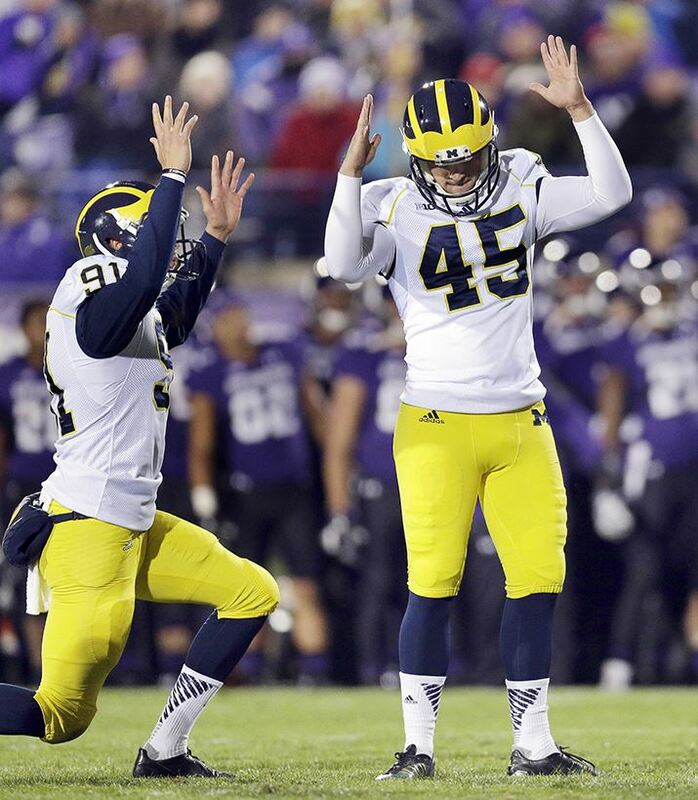 Weber State punter Blake O'Neill is transferring to Michigan. He has spent just one year playing American football and will be eligible as a fifth year senior graduate transfer in 2015. As technically a redshirt junior in 2014, he punted 62 times for 2,737 yards (44.1 yards/punt). He had a career long of 74 yards, landed 25 punts inside the 20-yard line, and kicked 18 punts more than 50 yards. That punting average was #6 in the Football Championship Subdivision and #1 all-time at Weber State. Standing 6'2" and 215 lbs., he ran a fake punt 20 yards and completed a 17-yard pass on another fake punt against Montana State. O'Neill brings an array of punting talents to Michigan. He can deaden the ball near the goal line, punt directionally, boom it deep, and generally limit return yardage. The nice thing about punting is that it translates well from one level or team to the next, so regardless of whether he's playing at Weber State or in the Big House, his kicks are going to travel a long way if that's what he wants. Michigan has had good punters for a while, including Zoltan Mesko and Will Hagerup in recent years. Unfortunately, Hagerup was inconsistent at times and even missed the entire 2013 season due to suspension. However, punt coverage was spotty last year, which should improve with the arrival of O'Neill as well as full-time special teams coach John Baxter. O'Neill gives Michigan three scholarship specialists, including incoming freshman kicker Andrew David and redshirt sophomore long snapper Scott Sypniewski. However, O'Neill also puts Michigan at 87 scholarships for the upcoming season, which means that two players need to come off scholarship before the fall. There is at least one player who could become a medical casualty (Chris Fox), and there are a few walk-ons who have had scholarships in the past that might have to pay their own way (Graham Glasgow, Ryan Glasgow, Joe Kerridge). Lawrence Marshall might see some significant playing time this coming season (LINK). Hit the jump for a few lovely females. Southfield (MI) Southfield running back Matt Falcon committed to Michigan on Wednesday. He chose the Wolverines over offers from Arizona State, Iowa, Nebraska, Ohio State, and Oregon, among others. Falcon is a 6'1", 215 lb. prospect. As a junior in 2015, he had 75 carries for 1,109 yards and 7 touchdowns. He claims a 4.41 forty. Hit the jump for more on Falcon and his commitment to Michigan. So it's finally official (LINK). Hit the jump for 1, 2, 3 good looking ladies! I don't know about you, but I was really annoyed about all the terrible calls on Monday night (LINK). Hit the jump for a few good looking women. One of the few 2010 recruits to stick with Michigan for an entire college career, Ryan was a Rivals 3-star and the #30 inside linebacker coming out of Cleveland (OH) St. Ignatius. He had a handful of MAC offers before committing to the Wolverines in January of 2010. Brady Hoke - who was at San Diego State - somewhat famously took a pass on recruiting Ryan, who would end up being perhaps Hoke's best defensive player at Michigan. Here's my commitment post on Ryan from January 2010 (LINK), and I named him the most underrated recruit in that class (LINK). When Ryan entered college, he was considered a bit of a project after missing a chunk of his junior year in high school due to injury. It was assumed he would redshirt, and redshirt he did while Rich Rodriguez and Greg Robinson played around with the 3-3 stack. When Hoke was hired and brought in Greg Mattison, Ryan became a SAM outside linebacker and changed from #37 to #90. He made an immediate wow play in the 2011 spring game when he jumped in front of a Devin Gardner pass and returned it for a touchdown while wearing the #37 jersey. That fall he switched to #90 and earned the starting SAM job, and he would finish the season with 37 tackles, 11 tackles for loss, 3 sacks, 1 forced fumble, and 2 fumble recoveries. That redshirt freshman season earned him some hype for a 2012 in which he did not disappoint. He made 88 tackles, 16 tackles for loss, 4.5 sacks, 4 forced fumbles, 1 fumble recovery, and 3 pass breakups, earning Second Team All-Big Ten. With expectations shooting through the roof, he promptly tore his ACL in the spring of 2013. It was early enough that he was not ruled out for the entire season, so he returned mid-year and made 30 tackles, 4.5 tackles for loss, and 1 pass breakup in an understandably mediocre campaign. Fully healed by his fifth year, Ryan moved to middle linebacker in a revamped defense and finished the 2014 season with 112 tackles, 14 tackles for loss, 2 sacks, 2 forced fumbles, 3 pass breakups, and his first career interception. He was named First Team All-Big Ten as a senior. For his career, Ryan ranks #17 in solo tackles, #3 in tackles for loss, and tied for #4 in forced fumbles. While he never had a truly dominant year, he was a very consistent player for Michigan every year except in 2013, when he hurried back after tearing that ACL. But "consistent" is not really what I think of when I think of Ryan. While he was reliable, he was one of Michigan's best playmakers on defense - from blitzing to deflecting passes to keeping outside contain to forcing fumbles, he was the one guy that offenses generally had to worry about on a play-to-play basis. He has never wowed anybody with his measurables, but he simply found a way to make plays over and over again. Defensive coordinator and linebackers coach Greg Mattison said several times throughout Ryan's career that he had an unorthodox way of playing the linebacker position, but he got the job done. Ryan would sometimes get his lower body out of position but find a way to redirect and make the tackle, or he might leap over a blocker, or he might sidestep a blocker instead of taking him on directly. Michigan's defense has been lacking stars in recent years, which you realize when you think about walk-on safety Jordan Kovacs being the biggest fan favorite since Brandon Graham wore the winged helmet in 2009. Ryan is the closest thing to a bona fide stud for the Wolverines since Graham terrorized Big Ten opponents in Rich Rodriguez's second year.
. . . his very first college game when he started at SAM linebacker, moved inside occasionally to blitz, and destroyed Western Michigan's quarterback while causing an interception that was returned 94 yards for a touchdown by Brandon Herron. That was the first sign - and it happened immediately - that we might have something special in Ryan. Ryan projects to linebacker in the NFL, although it's unclear exactly where he will play. He could be a 3-4 outside linebacker, a SAM linebacker in a 4-3, a middle linebacker in a 4-3, or an inside linebacker in a 3-4. At the NFL Combine, he ran a 4.65 forty, did 20 reps on the bench at 225 lbs., broad jumped 10', showed off a 34.5" vertical, and had a 4.2 shuttle time. I think he's best as an outside linebacker in a 3-4 look because he can rush the passer and has a knack for hemming guys in on the edge, and I think he fits as a SAM in a 4-3 look. I do not think he has the athleticism to be a star in the NFL, but I do think he can carve out a long career if he stays healthy. Video: Jim Harbaugh on "Saved by the Bell"
This was posted before Saturday's spring game, but here are eleven highlights to review Jim Harbaugh's spring (LINK). Hit the jump for some pictures of Sylvie Van der Vaart. Thank you to the previous donors toward the TTB redesign effort. If anyone else would like to chip in, you can use Paypal (on the left sidebar) or donate by purchasing items on Amazon (LINK). Thanks for reading and helping out! Prattville (AL) Prattville running back Kingston Davis committed to Michigan (LINK). 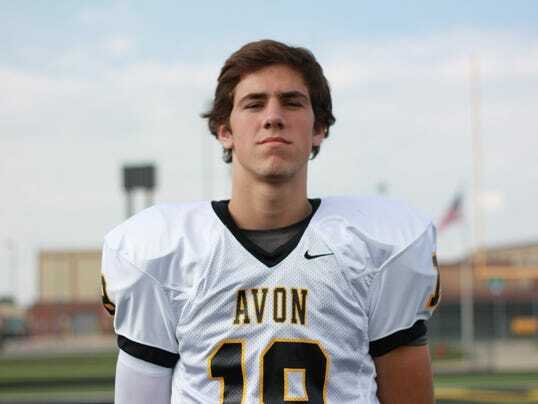 Avon (IN) Avon quarterback Brandon Peters committed to Michigan (LINK). Farmington (MI) Farmington fullback David Reese committed to Michigan (LINK). Brownsburg (IN) Brownsburg running back Toks Akinribade was offered by Michigan. He's a 6'0", 210 lb. prospect with offers from Cincinnati, Illinois, Indiana, Iowa, and a bunch of MAC schools. He's a 247 Composite 3-star, the #62 running back, and #781 overall. As a junior in 2014, he had 220 carries for 1,579 yards and 15 touchdowns. Akinribade is a solidly built running back with pretty decent speed and some good power, a solid all-around back. His teammate is 2017 quarterback Hunter Johnson (see below). Hit the jump for several new 2016 offers, some 2017 offers, some commitments elsewhere, and some random tidbits. 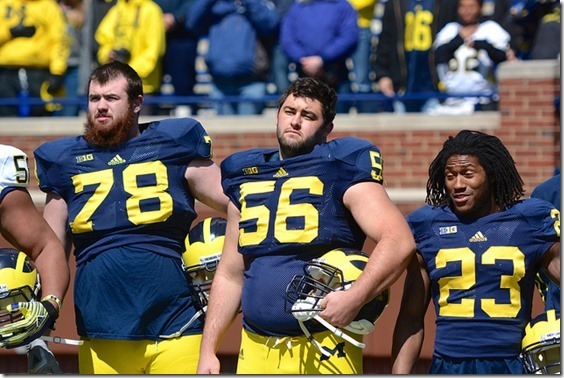 Nick Baumgardner has a piece on Harbaugh, Peppers, and Michigan (LINK). Hit the jump for three nice looking women. Prattville (AL) Prattville running back Kingston Davis committed to Michigan. He chose Michigan over offers from Louisville, Mississippi State, Ole Miss, and Southern Miss, among others. Davis is a 6'1", 225 lb. prospect. As a junior in 2014, he rushed for 1,407 yards and 17 touchdowns on his way to a state championship. He claims a 4.5 forty. The quarterback on the team was Keith Washington, an incoming freshman for the Wolverines who will play corner in college. Hit the jump for more on Davis and his commitment to Michigan. Here's Nick Baumgardner's take on the direction of the program (LINK). Hit the jump for some good looking ladies. QUARTERBACKS: With Wilton Speight nursing a slight injury, this was a game between Alex Malzone and Shane Morris. Malzone had the superior completion percentage, but Morris looked like the better quarterback. Malzone still has an ugly, baseball-pitcher delivery that needs to be shortened up. He looks okay on quick throws (bubble screens, etc. ), but any time he has to drop back and set up, the ball drops down to waist level and takes forever to come out. That is not something that gets fixed quickly. He made some good decisions but just doesn't have the ability to get the ball there quick enough (from a mechanical standpoint and an arm strength standpoint). Morris, meanwhile, also made some good decisions, showed nice touch on some throws we haven't seen him make before, and generally looked calmer in the pocket. 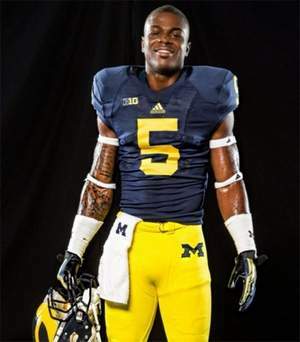 His Blue team picked on "cornerback" Dennis Norfleet a bunch, which I thought was a bit unfair. Norfleet has been practicing mostly at wide receiver, but he was playing corner due to a lack of depth with the split squads. Morris and the Blue team sent Amara Darboh and Jaron Dukes deep on him several times, both of whom are significantly taller and veteran receivers. If the season were to start today, I think Morris is definitely the guy . . . but Jake Rudock is on his way from Iowa. Hit the jump for some feedback on the rest of the position groups. Farmington (MI) Farmington fullback David Reese committed to Michigan on Saturday morning. He was committed to Louisville since early March, and he also holds offers from Cincinnati, Indiana, Pitt, and a bunch of MAC programs. Reese is a 6'1", 235 lb. prospect. As a junior in 2014, he made 107 tackles and is already the school's all-time leading tackler. He also ran for almost 300 yards, including 7 touchdowns. Hit the jump for more on Reese and his commitment to Michigan. This isn't an extremely in-depth article, but I found it interesting that Harbaugh is redecorating the weight room (LINK). Hit the jump for a girl with a nice front side, a girl with a nice back side, a girl with a nice everything, and then a gif of a blonde. Thanks to those of you who have donated via Paypal (on the left sidebar) or who have purchased items on Amazon (LINK) to help me raise funds for a professionally redesigned site. We've raised over $1,000 so far, which is awesome! Avon (IN) Avon quarterback Brandon Peters committed to Michigan on Friday evening. He chose the Wolverines over offers from Arkansas, Indiana, Iowa, LSU, Nebraska, Virginia Tech, and Wisconsin, among others. Peters is a 6'5", 205 lb. prospect. As a junior in 2014, he completed 148/263 passes for 1,876 yards, 21 touchdowns, and 6 interceptions. He also ran 73 times for 244 yards and 5 scores. Hit the jump for more on Peters and his commitment to Michigan. Start your weekend off properly with some good looking ladies! MLive has an article about inbound cornerback Wayne Lyons from Stanford (LINK). Hit the jump for a few pictures of good looking women. Thanks to Donald, Brian, Peter, Steven, and Robert for helping me pass $1,000 last night. Please consider helping with the $3,000 goal for a site redesign. Thanks to all of you who are shopping at Amazon via the link (LINK). Another way to help is to use the Paypal button on the left sidebar. Thanks again, everyone! 1. How does the offensive line look? Michigan was thought to be in pretty decent shape going into 2015 because all five starters were returning, plus a very experienced, versatile Erik Magnuson (who has played tackle, guard, and tight end). Then some funky things happened this spring. Fifth year senior Jack Miller quit football for personal reasons, and classmate Graham Glasgow violated his probation, which earned him some sort of undisclosed suspension. It's unclear whether Glasgow will play in the spring game, not to mention a possible game suspension for the upcoming season. Now a team with two fifth-year seniors on the line could potentially have zero seniors. The team's success hinges on the offensive line. Assuming Glasgow is available on Saturday and avoids further trouble, he should be Michigan's starting center going forward. From left to right, the line should be Mason Cole, Magnuson, Glasgow, Kyle Kalis, and Ben Braden. However, the coaches have been experimenting a bit with Braden at left guard, Cole snapping, and Magnuson at right tackle, so other combinations could appear. Regardless, Michigan is thin on the edge but has several good defensive tackle types (Bryan Mone, Ryan Glasgow, Willie Henry, Chris Wormley) who should put stress on those linemen. This will be a stiff test to see if the offense can run the ball and/or protect the quarterback. Hit the jump for discussion of quarterbacks, Jabrill Peppers, and more. Tom Fornelli ranks the top 25 college football coaches in Power Five conferences, and Jim Harbaugh makes an appearance (LINK). Thanks to Stephen for your recent Paypal donation! If anyone else would like to donate to the TTB redesign drive, please use Paypal (on the left sidebar) or do some shopping at Amazon (LINK). Thanks for your help! Michigan's spring game will take place on Saturday, April 4, 2015. Jim Harbaugh has announced plans to draft up teams, which will take place this coming Saturday, March 28. Spring games usually attract a lot of prospects, and Michigan already has some good ones lined up to visit. Commits: Andrew David, Karan Higdon, Shelton Johnson, Tyree Kinnel, Grant Newsome, Grant Perry, Nolan Ulizio, Keith Washington, Tyrone Wheatley Jr.
Toks Akinribade - RB - Brownsburg (IN) Brownsburg: Akinribade is a 6'0", 210 lb. prospect with offers from Cincinnati, Illinois, Indiana, Iowa, and Michigan, plus a bunch of MAC schools. He's a 247 Composite 3-star, the #63 running back, and #797 overall. As a junior in 2014, he had 220 carries for 1,579 yards and 15 touchdowns. He won't be in town for the spring game, but he visited on Tuesday and was offered by the Wolverines while in town. His high school teammate is 2017 quarterback Hunter Johnson (see below). Austin Anderson - OG - Mineola (TX) Mineola: Anderson is a 6'4", 285 lb. prospect with offers from Arizona State, Michigan, Mississippi State, Oklahoma State, Ole Miss, and TCU, among others. He's a 247 Composite 3-star, the #74 offensive tackle, and #846 overall. Riley Anderson - OG - Mineola (TX) Mineola: Anderson, Austin's twin brother, is a 6'5", 285 lb. prospect with offers from Arizona State, Michigan, Mississippi State, Oklahoma State, and Ole Miss, among others. He's a 247 Composite 3-star, the #76 offensive tackle, and #877 overall. Chris Brown - S - Houston (TX) Alief Elsik: Brown is a 5'11", 183 lb. prospect with offers from Houston, Louisville, Michigan, Purdue, and others. He's a 247 Composite 3-star, the #56 safety, and #855 overall. As a junior in 2014, he had 45 tackles, 2 tackles for loss, 5 interceptions, 2 forced fumbles, and 5 pass breakups. He will be in town with teammate Dontavious Jackson (see below). Hit the jump for lots and lots more prospects. The official site posted the rosters for Saturday's spring game (LINK). Hit the jump for a pretty lady named Ana Cheri. If you would like to help me meet the $3,000 goal for a site redesign, please use the Paypal link on the left sidebar or do some shopping at Amazon (LINK). Thanks to everyone who has donated a total of over $800 so far! 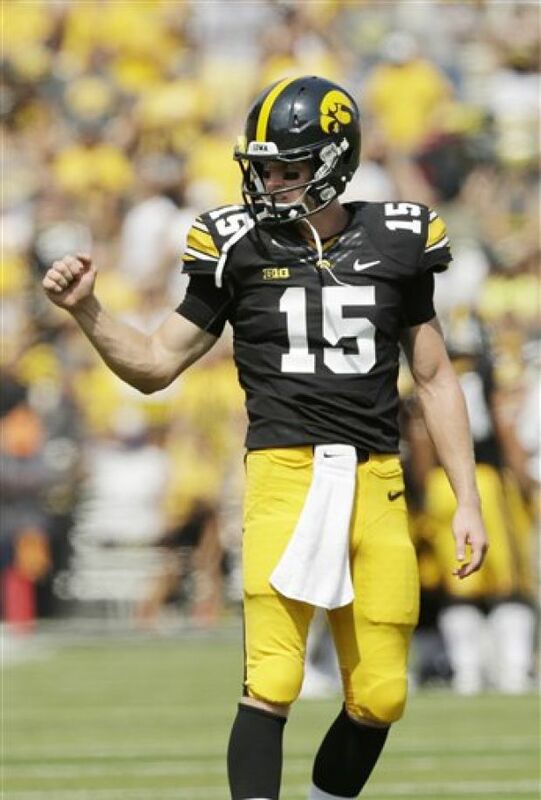 Dan Murphy and Bruce Feldman are both reporting that Iowa quarterback Jake Rudock has been granted a waiver from the Big Ten to transfer to Michigan. As a fifth-year transfer, he was also considering Boise State. Graduate transfers must enroll at a school in which their intended course of study is not available at the original institution. Rudock is a 6'3", 208 lb. quarterback who has started the majority of games for the Hawkeyes over the past two seasons. He sat behind James Vandenberg through 2012, but Rudock completed 204/336 (59.0%) of his passes in 2013 for 2,383 yards, 18 touchdowns, and 13 interceptions. He also ran 67 times for 218 yards and 5 touchdowns. As a redshirt junior in 2014, he completed 213/345 passes (61.7%) for 2,436 yards, 16 touchdowns, and 5 interceptions. He ran 67 times for 176 yards and 3 scores. Hit the jump for more on Rudock. Hit the jump for Durkin's presser. Thanks to Bradley for your recent donation! If anyone else would like to donate to the site redesign, please use Paypal (on the left sidebar) or do some shopping on Amazon (LINK). Thank you! Coming out of San Diego (CA) Francis Parker, Wile was a Rivals 2-star kicker. The hometown Aztecs went hard after him under Brady Hoke, and Wile was also pursued by Air Force, Nebraska, and Washington, among others. When Hoke was hired at Michigan, he extended an offer for Wile to play for the Wolverines. After playing in the U.S. Army All-American Bowl, he committed to Michigan in late January. Immediately upon arriving in Ann Arbor, Wile was counted on to be the kickoff specialist. He averaged 64.0 yards/kickoff and also averaged 41.6 yards/punt on 17 attempts. ESPN and the Big Ten Network named him to their freshman all-conference teams. As a sophomore in 2012, he averaged 60.5 yards/kickoff, averaged 35.9 yards/punt, and went 2/3 on field goals with a long of 52 while handling the long field goal attempts. During his junior year in 2013, he averaged 59.8 yards/kickoff and went 3/5 on long field goals; he also became the full-time punter while Will Hagerup served a year-long suspension, and Wile averaged 40.6 yards, landing 16 inside the 20-yard line and booming 10 of them 50+ yards. Then as a senior, he became the full-time kicker and went 15/21 on field goals, made 28/28 extra points, and averaged 63.0 yards/kickoff; with Hagerup's return, Wile punted just once. This past season it was hard to believe that Wile was a senior. When he was recruited in 2011, he was the beginning of the trend that Brady Hoke was looking for solid, upstanding citizens who you would want to marry your daughter. As a U.S. Army All-American coming out of high school, there was a feeling that he would have a breakout season or become a weapon at some point in his career. Instead, he was mostly a steady, all-around kicker who always kept himself available. He played in every single game Michigan played for four years, 51 straight. He did not have any extremely memorable moments like his predecessor Brendan Gibbons (who had all-time great kicks against Virginia Tech and Northwestern), but his career didn't have many memorable low points, either.
. . . being there when the other renegade kickers on the team were unavailable. Gibbons allegedly raped a girl and was eventually booted out of the university, leaving Wile to pick up his duties. Meanwhile, Hagerup was suspended for at least one game from 2010-2013, including the entire 2013 season. The guy who stepped in every time to pick up the slack was Wile. The best part of Wile's game was his kickoff. He was very consistent in either getting touchbacks or pinning the ball near the left pylon, leaving returners with limited space to work. Unfortunately, NFL teams want kickers to be able to do more than kick off. Wile's punting and placekicking are not up to snuff for the next level, so his professional career has probably come to a close. Who will be Michigan's leading receiver? Touch the Banner, established in 2008. Awesome Inc. theme. Powered by Blogger.